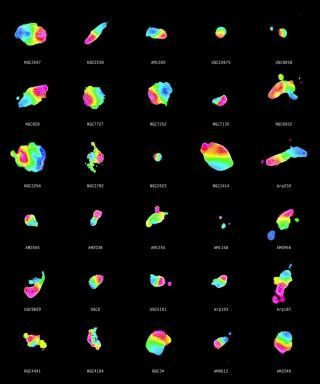 Their observations of carbon monoxide in 37 colliding galaxies showed pancake-shaped zones of molecular gas, similar to the shape that disc galaxies — which include spiral galaxies and lenticular galaxies — would assume. "This is a large and unexpected step towards understanding the mystery of the birth of disc galaxies," lead researcher on the study Junko Ueda, a postdoctoral fellow at the Japan Society for the Promotion of Science, said in a European Southern Observatory statement. Before, astronomers thought that only elliptical galaxies could arise from mergers. Simulations from the 1970s, however, concluded that elliptical galaxies should be the most popular type of galaxy in the universe. Yet these odd-shaped entities comprise less than 30 percent of galaxies. The new study could help explain why scientists see so many spiral galaxies like the Milky Way in the universe, according to ESO. The astronomers' work is the biggest molecular gas study so far, but they said they plan more work to follow up on their research. Astronomers emphasized more observations of older galaxies are required to see if mergers behaved similarly in the young universe. "We have to start focusing on the formation of stars in these gas discs. Furthermore, we need to look farther out in the more distant universe," Ueda said. "We know that the majority of galaxies in the more distant universe also have discs. We, however do not yet know whether galaxy mergers are also responsible for these, or whether they are formed by cold gas gradually falling into the galaxy. Maybe we have found a general mechanism that applies throughout the history of the universe." The research was published in the Astrophysical Journal Supplement.